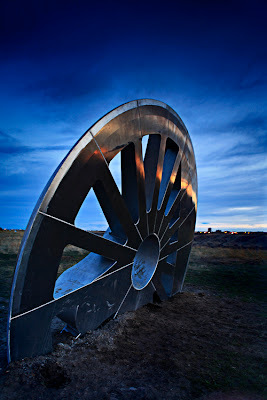 I was in Lethbridge Visiting family for the Easter Break and had the desire to shoot some landscapes. I packed up a few of my filters, my tripod and my camera and headed towards the High Level Bridge. I eventually set up on the East side of the Coolies over looking the valley below and the bridge. I got there a little later then I had planned but tried to make the best of it. 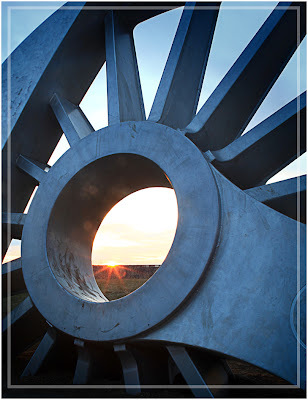 I started off facing the sun and began shooting through the wheel sculpture they have by the Galt Museum. The sun set ended up being kind of blah so after the sun had gone well below the horizon I began looking for other other perspectives of the wheel. I noticed that the surface of the wheel was highly polished and had the idea to turn my back to the setting sun and shoot the last rays of the day bouncing off the wheel. After a few graduated filters and some camera adjustments I made the following image. When you're not liking what you are seeing in front of you, try moving around and see what else you can find. try different angles, lenses, shutter speeds and use up some space on your memory card. digital memory is cheap. You might be surprised at what you find. When I got back home I ran the image through some post processing and made the following image. I wanted a dirtier feeling to the photo and added some additional texture.